I hope everyone had a Merry Christmas We lucked out here in the Midwest and managed to pull off a white Christmas thanks to around 4 inches of snow on Christmas Eve. I think it just makes it a little more special when you can open your presents surrounded by a fresh batch of the fluffy stuff. What I wasn’t ready for was the deep freeze that followed immediately after. We really didn’t have a Fall so my body hasn’t really conditioned to cold. From the looks of it, this polar vortex is going to be hanging around for a while. Lucky for me I can always recall (and share) memories of warmer times. Today’s post features another +1 in my North American Birding List. They also come from two locations that are both definitely warmer than what we are experiencing now. The first set of pictures came from a trip back in August 2013 to Las Vegas, Nevada. If you have been following this blog for any length of time, you probably read Las Vegas and immediately thought Henderson Bird Viewing Preserve. if you are new to the blog, that preserve is a gold mine for birders. I should sum up all the +1’s I’ve pulled out of that location – guessing it is somewhere in the 30’s if not the 40’s. This is one of those times when my bird count rules have really cost me. Even though these shots of the American Avocet were taken all the way back in 2013, I have not been able to claim them on the list until now. When my official list was started, a rule was added that stipulated that I had to visually see it (no easy out by simply hearing the sound) there had to be photographic evidence of the encounter sufficient to tell what the hell it is and lastly it had to be featured on my blog. The latter is always the kicker thanks to my backlog of images. So, yes, I have had a new bird waiting in the queue for four years. Look on the bright side, when it is cold out like it is today, I can always go back into my photo archives and bird from the comfort of my den. This particular shot was taken on the far pond straight out from the visitors entrance. It was the only Avocet found during the entire afternoon we were there, busy hanging out probing the waters with that very distinctive upturned bill. 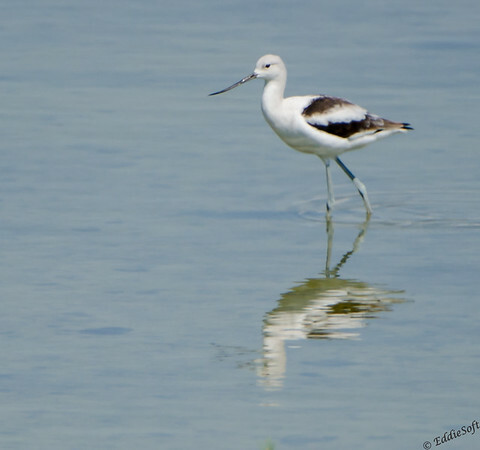 The Avocet happens to be one of those shorebirds that can be identified immediately on sight – always considered it the byproduct of a secret romance between a Godwit and a Black-Necked Stilt. 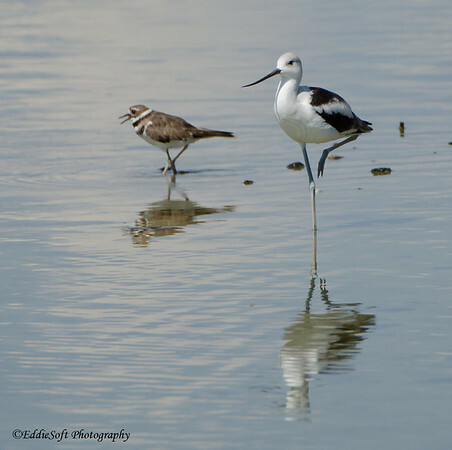 Whenever someone sees the Black-Necked Stilt they tend to get a very favorable opinion of them – their black and white coloring is stunning to see and quite frankly they are uber-cute with their dainty features and Flamingo like stances. This must mean the Avocets get their disposition from the Godwit side of the merger. 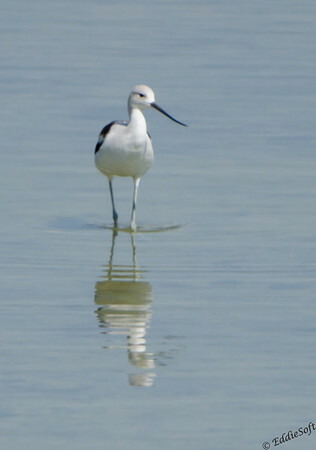 Why… well based on my experiences, these Avocets tend to stick their noses in other birds’ business. lash out with bad intent. Not sure what brought me a bigger laugh, the audacity of this Cyrano de Water or the duck that just sat there taking this all in without moving a single feather. Clearly used to these nosey Avocets. Henderson wasn’t the only warm place we spotted this species. That same year in November we headed over to Galveston, Texas to enjoy the Texas Gulf Coast. This was our first time to the region and it didn’t take long to realize that the Gulf Coast can give Henderson the run for the money when it comes to new entries in the list. Texas is amazing! We went back in December 2016 and plan to be back very soon. 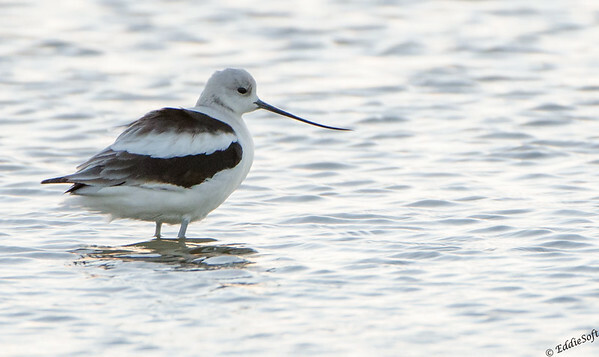 The Avocets in the Galveston area didn’t display the same outward aggression as the one in Henderson. For the most part the Texas variety would simply stroll over to a bird that clearly was invading its 9 foot personal isolation sphere and point its assets directly at it. In the case below it simply exclaimed “Father!”… sorry, sorry. No, it really would simply lift its foot out of the water and point to the snoz with a sly smile. 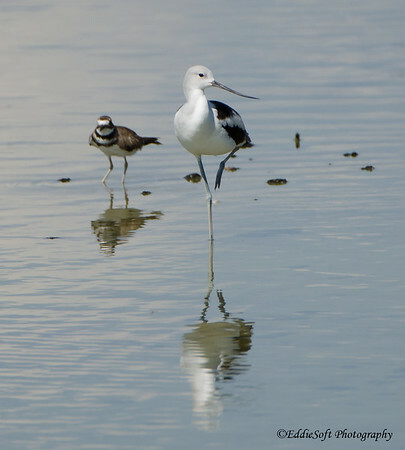 Even this Stilt with the equally impressive snoz of its own realized it was no match for Cyrano. Demoralized the cute Stilt would bow to the superior weapon, put tail feathers between the legs and slink back to calmer waters. I swear I heard that Avocet taunting the Stilt as it retreated. Well, looks like I am out of pictures for this post. Hope you enjoyed seeing the new bird on my list! Time to give up my warm memories and get back to the reality of the cold. Take it easy everyone – warm thoughts!